'Experiment', referring to science, is a research method carried out to support, refute or validate different assumptions. Relating to the culture, art and music, the experiment becomes a search for innovation, different ways of expression and sensibilities. Questioning the already known elements the artists explore the unpredictability of their own talent and imagination. The Camerata Europaea (CE) wants to break new ground by creating innovative programs and giving way for experimental orientations. This platform accesses the audience and involves it actively. New means of expression will be discovered and creative ideas will be developed. The CE supports a sustainable dialogue with training programs (tonSpuren), interactive experiences (workshops), Europe-wide cooperation initiatives (Creative Europe Cooperation Program) and modern cycles (experimental videos/performances). All this draws a thematic bow between music, art, culture and lifestyle. Music and architecture – what do they have in common? Music creates a world out of sound, architecture creates a world out of raw material. One world is immaterial, while the other is visible and touchable. At the series 'Music meets architecture', both disciplines go hand in hand. 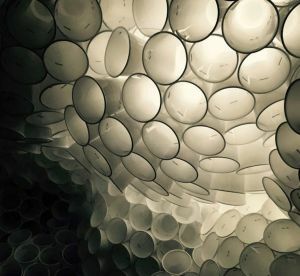 The collective Krater Fajan, which is upcycling old materials for its art, built a sculpture out of 18.000 plastic cups. The sculpture was fixed above the concert hall. 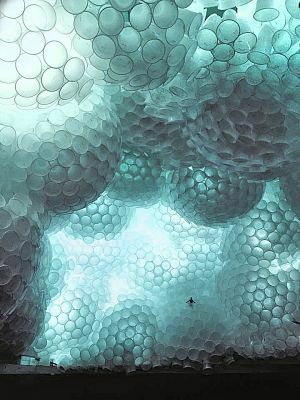 Alighted by visuals and in connection with music of Mendelssohn Bartholdy, room and sound transformed to a synesthetic overall impression. This transferred a vision of the world that can be created if sound and space form a symbiosis. Utopia draws a picture of an ideal society. Frequently, there is still a great gap between this longing and the reality that surrounds us. There is a beautiful metaphor for this: diamond, the hardest mineral and graphite, the softest mineral, are both carbon. Due to their molecular structure, however, there are great differences in their strength. This principle could also apply to mankind. Fixed, inelastic systems are created through hierarchical structures, nationality and religion. If we were to recollect our original, great common ground of being-human beings, these fixed structures would break open. One way to do this is through music, art and culture. CE strives to combine various artistic disciplines. Not only the artist crosses the boundaries of his art, he also takes the viewer or listener on this journey. Especially music and art are able to show us the relativity of rigid patterns of thought and how to loosen them. What is the sound of an object? Can an object be assigned a sound, even a tone? And how come this sound? These questions can be answered by adding an acoustic dimension to objects. In order to answer these questions, is necessary to do a creative analysis of the objects. Through experiments the Camerata Europaea searches for acoustic traits of objects. This search will soon no longer refer to objects only. It extends to the acoustics of workflows, movements, spaces and much more. In the end, the entire sound of a creative world can be incorporated into the results of this search. The search for inspiration and the longing for enlightenment accompany mankind since its existence. Also Art resembles an endless search for new things. It has the power to compose its own worlds and bringing it to life. Through modern reinterpretations of classical works they are transposed into the timeless. On the one hand, this is achieved through creativity and innovation. On the other hand, there is a revival through a touch of our present-day spirit. The desire for something fresh, daring and moving is driving every creator. New approaches modify our traditional understanding of the arts and our expectations. The result is a world without artistic certainties that makes the viewer a part of it. This unorthodox approach requires a curious, progressive audience. Traditional mechanisms are erased and replaced by heterophonic, polyphonic, visual and musical lines. Within the framework of the 'Borderless' festival, such an opportunity presented itself with the reinterpretation of Stravinsky's 'The Soldier’s Tale', which was brought to the present through new media, choreography and music offering a new experience. This is the magic of Art. The project targets an international audience with the central location of Berlin and the EU countries and takes the spectator to spectacular places within everyone’s own interpretation. Artists are supported and encouraged to create their art within a new context. As major musical event these concerts communicate distinguished, as well as experimental musical culture and sound art. The series represents a musical research and an artistic border experience. By reinventing the existing musical culture, it offers a new level of interpretation. The synthesis between the different art forms is a crucial factor distinguishing it from the great mass of performances and offers a platform for a musical discovery. The series offer a framework for one-of-a-kind experiences and unique impressions for the audience, which are emphasized by the interaction of the public with the artists. 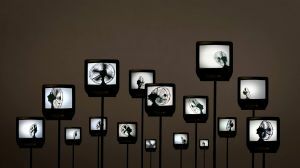 The series offers a broad spectrum and new trends of contemporary music and visual art with new media and applications of technology in the arts and opens it for discussion. Music, art, improvisation and performance merge together.